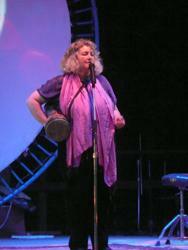 Starhawk leads meditation at Wisteria Summer Solstice Gathering, 2009. A community needs a spiritual heart. When we face discouragement, loss, and grief, we need condolence and a way to renew our vision. When we are wounded, we need a place to heal. And when we complete a challenging task or win through to a cherished goal, we need a way to share our joy. When we come together in spirit, we set aside day-to-day problems and meet the full spectrum of who we are: body, mind, energy, emotions, and soul. We connect back the core values that motivate us. We renew our vital energies and recover our sense of hope. We remember the sacred, not in the sense of what we bow down to, but of what we hold most important, what we cherish beyond our own comfort, convenience, or profit, what we stand for. Communities that form around a religious or spiritual leader or who inherit an intact tradition have a clear blueprint for how to honor the spirit. But what about communities who include people of many different faiths, or none at all? Political activists who are wary of anything too woo-woo? Atheists who take issue with any form of belief? Ritual can serve many purposes. It can connect us more deeply to place, to the cycles of the seasons and the demands of our own soil and climate. It can mark the passages of our lives and help us make the transition into a new phase. It can succor us in grief and loss. It provides chance for artists, musicians, poets, and dancers to share their gifts, and for everyone to discover some facet of their own creativity. It can link us in the pure joy of celebration. Our land in Sonoma County gets the highest amount of rainfall in California, but also has one of the longest dry seasons. It’s wet in winter, bone-dry in summer, and the combination creates a huge fire danger during the dry season. For many years now, a few of us gather each summer as the land begins to dry. We create a simple ceremony, bringing together branches from our favorite trees, tying them together into a simple charm, a triangle bound by a circle. We each speak about the tree we chose, and what we love about it. We hang the charm up high near the fire house with prayers for the safety of our land. In winter, after the rains come back, we take down the charm, offer prayers of gratitude, and cut it in pieces to burn in our wood stoves to protect our homes. The ritual came to us out of the particular rhythms and needs of our land and place, and gives us a way to honor the land and one another. Near Melbourne, Australia, a community named CERES has restored a polluted section of Merrie Creek and built an ecological education and arts center. One day, while holding a program, they heard a thud at the window. They went out and found a small kingfisher had flown into the glass. They were both thrilled—because that species had been thought extinct in the area—and saddened as the bird lay still. But after a few moments, it fluttered its wings, opened its eyes and flew off. Now every year they commemorate the day with a Return of the Sacred Kingfisher festival and ritual. Children make costumes and put on plays. Old students return, and supporters of their programs come out for performances and processions and a celebratory feast. The festival links the community together and ties it firmly to its own history, allowing it to relive that happy moment when the success of their restoration efforts became evident. A young girl has reached the age of her first menstruation. The women dress in red and take her up to the top of a high hill overlooking the city. They tie her hand together with her mother’s hand, and they run as far as the mother can run. When she tires, the women cut them apart and the daughter runs on alone. Then they all return to the girl’s home, sit in a circle, and tell her tales of their own first menstruation. They share funny stories, sad stories, raunchy tales, nuggets of advice. As each woman speaks, her own story becomes woven into the fabric of women’s history. They end by joining the men and boys who have prepared a feast of red foods. The young girl learns that the whole community, women and men both, can celebrate the sacredness of her body and its women’s cycles and honor her growing maturity. Ritual can help us through life’s passages. In our book Circle Round: Raising Children in Goddess Tradition I and my co-authors Anne Hill and Diane Baker share many stories of simple rituals we and others have created to help our children in their maturation. Fertility rituals allow the community to bless a woman’s or couple’s decision to conceive a child. Rituals surrounding a birth welcome a new child to the world and help the parents adjust to their new roles. My housemates Sabine and Mark created a ritual for their baby Leonie Lotus to mark the moment when she began to eat solid food. The ceremony allowed them to let go of her early infancy and to welcome her first move into independence. Anne Hill created a ritual for her son Bowen to help him move from toddlerhood into being a big kid. Most traditional cultures use ritual to help children move into puberty and adulthood. And, of course, marriage rituals celebrate a couple’s love for one another and allow the community to witness and support their commitment. When we face life’s harder passages, ritual is deeply important. When we approach death, ritual can help us let go and allow our community to express their love. When someone close to us dies, ritual can help us move through our grief. When we honor the ancestors or our beloved dead in ceremony, when we build altars or shrines, speak their names or remember their contributions, we are saying that they are important to us, that their memory remains alive. Ritual can also be a way to prepare for danger or difficult challenges. Before one big protest against the International Monetary Fund and World Bank meeting in Washington DC in April, 2000, a group of us from our Pagan Cluster of activists offered a ritual to help people face the upcoming blockade with confidence and courage. We wound dozens of balls of yarn together, drew people into a circle and, tossing the yarn back and forth, wove a web of connection. When we cut the web apart, we each tied a thread around our wrists to help us stay connected. We took the remaining yarn into the streets with us the next day and wove a web around our intersection, which became a soft blockade that kept us from being run into by the motorcycle police. Ritual in community can serve to connect and unite, but it can also be divisive if enthusiasts try to inflict it on the reluctant. How do we introduce a spiritual connection to those who might be uncomfortable or wary? First, be aware that ritual can have its dangers. When we create ritual anew, we are sometimes tempted to borrow from other cultures or traditions. If we do, we should be careful to do so respectfully. Ritual at its worst can also be dull, pompous, or full of clichés. Inflicting stultifying ritual on an unwilling group will not build connections. But by understanding some simple ground rules, we can create powerful and empowering rituals. Never force ritual on anyone. Offer it, but leave people room to opt out without paying a heavy social penalty. If the ritual works, people will share their enthusiasm and the reluctant ritual avoiders may be attracted to the next one. Be careful about borrowing from cultures that are not your own. We live in a multicultural world, and we may find ourselves drawn to myths and symbols that do not come from our direct ancestors. Each tradition has its own deep wisdom and we have a lot to learn from one another. But when we take over the symbols or practices of another tradition without permission, acknowledgment, training, or commitment to the real-life struggles of the people, we are in effect appropriating their culture as others have already appropriated indigenous lands and labor. Yet indigenous cultures have much to teach us as we strive to regain an ecological balance. How can we learn respectfully? Long ago, meditating on this question, I asked the ancestors what they thought. They said, “We don’t really care who your ancestors were. We care what you’re doing for the children.” Learn about and support the real-life struggles of the people whose traditions you admire. Commit to their survival and the continuance of their culture. Give back. Don’t claim authority in a tradition you haven’t been trained in, ask permission, and give credit where it is due. Foster a better world for the next generations, and you will be acting in integrity. Community ritual works best when many people contribute their creativity. One person might sing a solo; another might lead a guided meditation, a third might lead the group in dance. Sharing the roles and the leadership allows everyone to shine and keeps the ritual varied and interesting. A ritual that works moves us emotionally. It speaks to our Younger Self through the language of the senses, using color, smells, tastes, actions, rhythm, music, poetry, and dance to make us all participants, s/heros of our own stories. In planning ritual, we begin with a need. What might this ritual help us do? Honor the change of seasons or celebrate the harvest? Offer healing to a friend or celebrate a life passage? Release conflict in our community and draw in new inspiration? Ritual is most powerful when it works on multiple levels: the cosmic, the community, and the personal, giving us each a stake in the outcome. When we celebrate the harvest from our gardens, we can also celebrate the ways we have grown in our personal lives and the harvest of wisdom and lessons learned. Keep the intention short: no more than one or two lines. Intentions that ramble on for paragraphs are not clear enough to provide the thread for a ritual. Once the intention is clear, find actions that express it. Make them vivid, colorful, sensory. For that spring ritual, we might pass around ice cubes for people to hold as they meditate on what they want to release. They will feel the burning cold melt into dripping water that might fall on a bowl of rich earth, where they could plant seeds to represent what they want to grow in their lives. Use images that speak to us all—like the seed—rather than obscure deity names or cultic symbols. A powerful ritual is like a three-act play. The first act creates sacred space—in Reclaiming we do this by grounding, creating a circle, invoking the elements and the sacred. The second act is the heart of the ritual—the actions embodying the intention, with an arc of rising energy that builds to a climax of dancing, chanting, and toning. The third act is the cool down period, when we ground the power and give thanks to all that we’ve called in. We may share food and drink, or speak from the heart on some subject, or sing, or sit together in silence. The rituals you create may take a different form, but thinking about the three act structure can help create an effective arc for the energy—a period to set the stage, another to face the challenge and build energy to a peak, and a phase of resolution, thanksgiving, and transition back to ordinary life. There are many other, simple ways to share spirit in community. Sitting in circle, speaking from the heart, building shrines and altars, setting aside time for silence or to be together in nature can all serve to connect us more deeply. We can find multiple ways to share with one another the treasures of the spirit, to forge deep connections of heart and soul, to engage our creativity, love, and compassion, to forge the deep connections of heart and soul that can strengthen our work together and enrich our common lives. The Spiral Dance: A Rebirth of the Ancient Religion of the Great Goddess (HarperSanFrancisco) is the classic introduction to Goddess-centered Paganism. Truth of Dare: Encounters with Power, Authority and Mystery (HarperSanFrancisco) employs ritual to undo the inner wounds of patriarchy. The Pagan Book of Living and Dying (HarperSanFrancisco), co-written with M. Macha Nightmare, contains rituals, philosophy, and liturgy for the end of life. Circle Round: Raising Children in Goddess Tradition (Bantam), co-written with Anne Hill and Diane Baker, contains rites of passage, seasonal rituals, and stories to share with children. The Twelve Wild Swans (HarperSanFrancisco), co-written with Hillary Valentine, is a spiritual training manual for creating both inner and outer-directed rituals. The Earth Path: Grounding Our Spirit in the Rhythms of Nature (HarperSanFrancisco). Starhawk’s newest book The Empowerment Manual: A Guide for Collaborative Groups (New Society Publishers) explores group structure and dynamics for communities and collectives.